In the past 15 years,we always held the Great Wall of China Marathon on May 1,and up till the 15th Great Wall of China Marathon on May 1,2016,the Great Walls that we used are Badaling Ancient Great Wall,Jinshanling Great Wall and Simatai Great Wall! In this past 15 years,it is our greatest honor that we have met the world most excellent runners,we know that some runners even try one marathon a day,and some runners try to run for one week,and run 60KM every day.And there are also quite a number of runners who run the marathon once a week.And one of overseas runners who have already run the Great Wall of China Marathon on May 1 for the 7 times in the past 7 years would like to come again! In order to best satisfy our runners who can run 3 marathon races in the first three Sunday of October,we tremendously introduce the joint marathon tours from South Western China to Southeastern China and north to the capital city of China--Beijing!You would run half of China and enjoy the pure local customs and the very advanced three Chinese cities--Beijing,Guangzhou and Shenzhen,no mentioning the beautiful Li River in Guilin and the hidden beautify Xijiang. 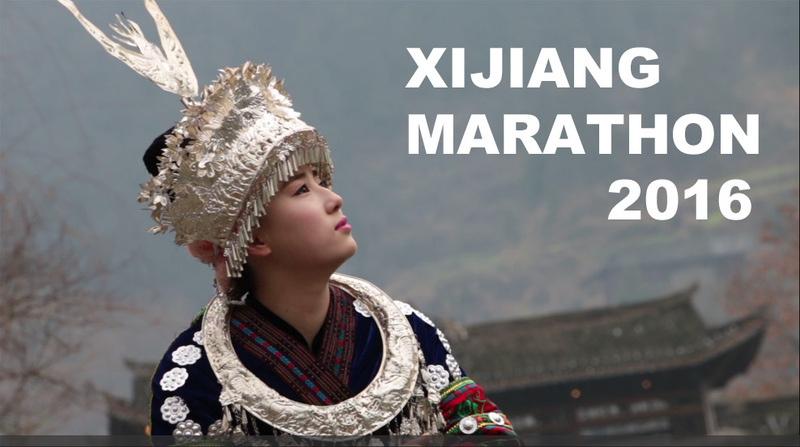 We will release XIJIANG MARATHON 2016 Promotion Video by the end of this month or early June. For the first marathon XIJIANG MARATHON in this 18-day marathon tours in China,you would need to fly to Guiyang City in southwestern China.There are interenational direct flights to Guiyang from Singapore,Thailand,South Korea,Japan,Hongkong and Taiwan. You can reach Guiyang by connecting your flights from those cities in China:Beijing,Shanghai,Guangzhou,Kunming. And if you are living in China,you can fly to Guiyang from your airports.There are more than 100 flights every day from every important airports in China to Guiyang! 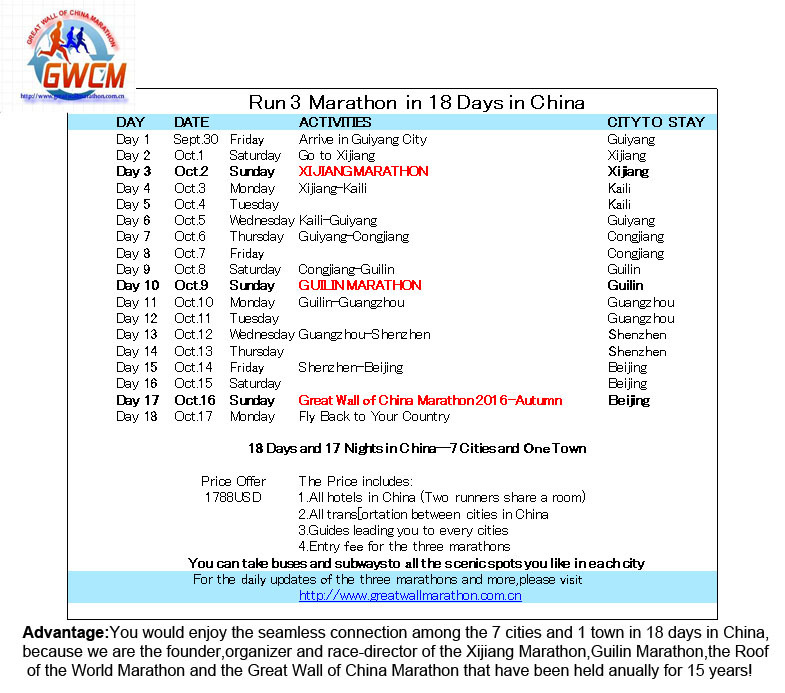 If you would just run XIJIANG MARATHON on October 2 and GUILIN MARATHON on October 9,please see the picture above,and then you would fly from Guangzhou back to your country on October 10.Then you would be staying in China for 10 nights and 11 days,then your fee is 998USD. 1) 10-night hotel 2)All the transportation between all the cities 3)Guide leading you to every cities 4)Entry fee for two marathons. Then our guide will pick you up at Guiyang Longdongbao International Airport on September 30 and see you off at Guangzhou Baiyun International Airport on October 10. It is really so exciting to have all of these,and from today,we would introduce all the three marathon every day! And the 18 days or the 11 days of your marathon tours in China would become your very unique and beautiful memory again! 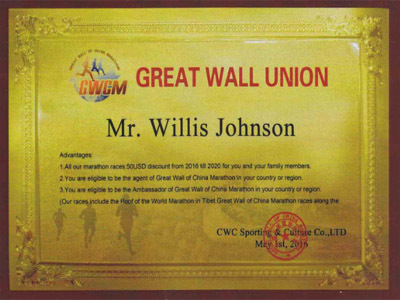 For the runners who run the three unique marathon races in China this year,and you would be presented the most valuable and the most surprising gift at the Juyongguan Great Wall in Beijing on October 16,2016! You can click the pictures below to fill in the Online Application.We are waiting for you.We work on this tours 24-hour with this special hotline here +86-183-1042-0937(Call from outside Mainland China),or 183-1042-0937(call from Mainland China) or write to us from our email here! 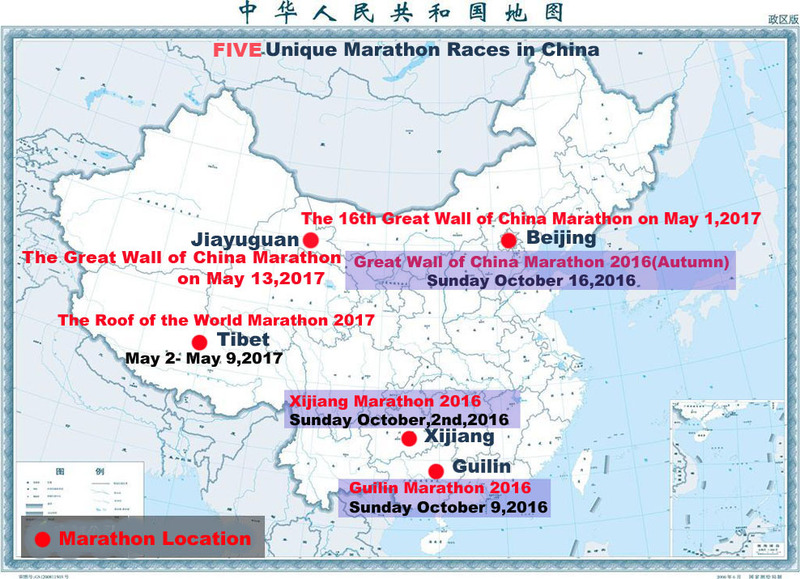 Unique:Two Unbeatable Reasons to run the Great Wall of China Marathon 2016-Autumn(May 21,2016)New! 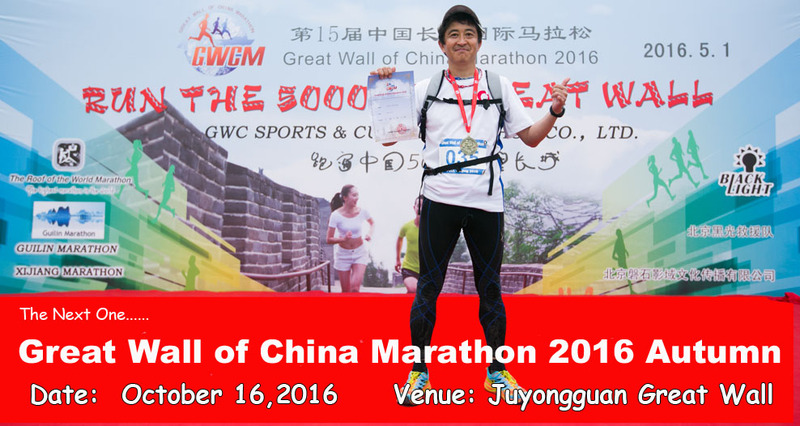 Here The Online Application of the Great Wall of China Marathon 2016-Autumn. We are the founder,the top organizer and race director of all the marathon races in the map. The Online Application for the 16th Great Wall of China Marathon 2017 is open below here,too. 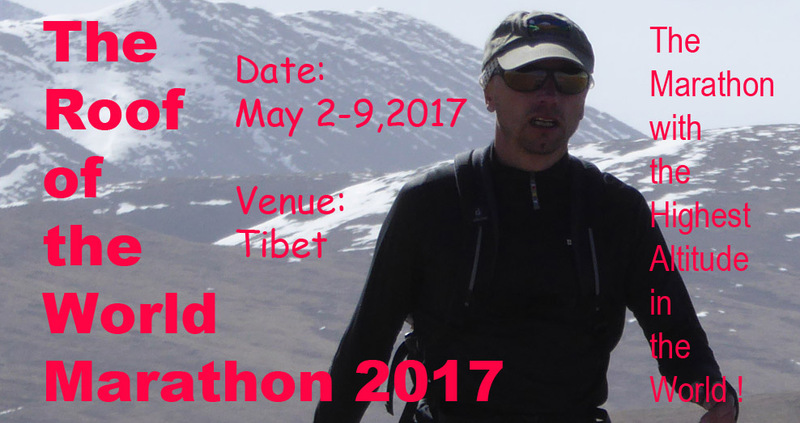 The Online Application of the Roof of the World Marathon 2017. If you have any questions during your sign-up any of the above 5 marathon races in 2016 and in 2017,please feel free to write email to us or call us.Thank you all very much from all our hearts for your greatest support !